Bobby Hebb - Ihor Omelchuk. Fantasy on a theme by Bobby Hebb "Sunny"
Video demo: Ihor Omelchuk. 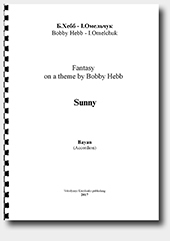 Fantasy on a theme by Bobby Hebb "Sunny" for bayan (accordion).